It looks like there may actually be some traction for Mayor Rahm Emanuel’s grand plan for express rail service to O’Hare Airport. Yesterday the city announced that by March it will select an engineering team to develop conceptual designs, including routes and terminal options. The CTA Blue Line is already an efficient way to travel between O’Hare and the Loop, which could easily be improved through a few simple upgrades. But last year Emanuel and aviation commissioner Ginger Evans stated that the airport express service was a priority for the administration. Evans even threw out the rather far-fetched idea of double-decking the Blue Line to make room for the express trains. And, of course, Emanuel’s proposal is overshadowed somewhat by former mayor Richard M. Daley’s failed attempt to establish an O’Hare express train. That resulted in the city spending $250 million to build a superstation under the Loop’s Block 37, which now sits empty. With Emanuel under attack for multiple police scandals and the Chicago Public Schools financial crisis, it seems like an odd time to move forward with a plan that would largely benefit the well heeled folks who’d be willing to pay a premium for a faster ride to the airport. But yesterday’s news release made a few other arguments for the proposal, asserting that it would help take cars off the region’s roadways, encourage more investment in the city, and create long-term jobs. In March, the aviation department will pick an engineering team to analyze and develop conceptual designs for the rail service and lay out an overall timeline for the project. The city recently put out a request for proposals from vendors who were asked to develop designs. The department will be choosing from the three proposals that were submitted. The final proposal will evaluate the different options for the express service’s route, terminals, and amenities. The city says it will start negotiations with relevant stakeholders this year, and a contract for the final design, construction, and financing of the project could be awarded in 2017. There’s no cost estimate for the project yet, but a business plan for the airport express created for the CTA in 2006 estimated that a Blue Line-parallel service with separate tracks would cost $1.5 billion. Yesterday’s release says the city’s goal is to make sure that the luxury rail service can be built without taxpayer money. Large transit projects in Chicago are usually paid for with federal grants, but it looks like Emanuel might pursue a public-private partnership here instead. It’s unclear whether the premium O’Hare service would generate enough revenue to pay back a private investor. CrossRail would solve Mayor Emanuel’s initiative to run express trains to O’Hare airport by using Metra – not CTA – infrastructure, and bringing upgrades Metra sorely needs. Another funding possibility is airport passenger facility charges. These normally can’t be used for projects located outside of an airport, but perhaps the Emanuel administration will try to persuade federal authorities to let them bend this rule. At any rate, it’s important for Emanuel follow through with his pledge not to spend taxpayer money on rail service that most Chicagoans wouldn’t use. It would be inequitable if luxury train service was to divert tax revenue from more pressing neighborhood transit improvements. On the other hand, there is a scenario where the O’Hare Express could have wider benefits for Chicago residents. The Midwest High Speed Rail Association says the airport plan should use existing Metra, rather than CTA, infrastructure as part of a proposal called “CrossRail,” with an estimated cost of $2.2 billion. Cross Rail is a package of Metra rail improvements that MHSRA says would increase the commuter rail system’s reliability and create rider-friendly service patterns. The plan calls for linking the Metra Electric tracks with Union Station, by way of a new flyover and river crossing at 16th Street. Investing in upgrades for an O’Hare express on Metra tracks could address the commuter rail service’s existing needs. Metra wants to upgrade track switches – the A2 switch dates back to 1932 – within Chicago that delay trains, and eliminate dangerous at-grade road crossings near the airport. 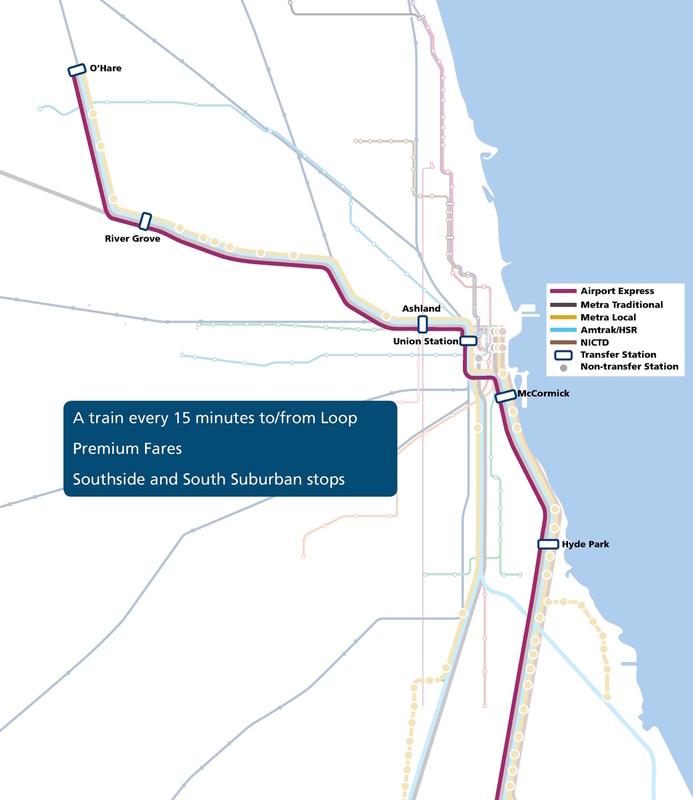 And, since CrossRail would connect the Union Station lines with the Metra Electric, which serves the South Side and south suburbs, there would be a wide base of political support for the investment. In other words, unlike a Blue Line-based O’Hare express service, CrossRail wouldn’t just be a project for relatively wealthy people traveling between the airport and the Loop. Read more about the CrossRail proposal here. At $30-$35/trip, I don’t see this being very feasible. Unless you are going downtown right where the train terminates, you’ll, still have to take a cab to your final destination. I was in Melbourne recently, and they have an express bus service from the airport to the CBD. THe buses leave every 10 minutes, and each ticket includes a free shuttle ride to most hotels. Unless they can make that final connection, I don’t see business travelers wanting to use this. For leisure travelers, it will be too cost prohibitive. Better to pay for, or split a cab. Express buses on the side of the Kennedy would work. Eliminate a lane of traffic and done! This would also allow for Pace buses to do the same. Meanwhile, Toronto’s experiment with a luxury airport express train is falling well short of expectations. Man, I feel like this is my response to every Chicago transit related story, but: if you really want to clear cars off of the roads around Ohare, then you need public transit options to get there from the north, west, and far southwest sides of the city. “Beltline” trains would be ideal, but even express busses would be a start. The MHSRA at least adds some needed far-south connectivity in the city, but it’s still more spokes in a city in need of wheels. Yeah, $30 to 35 comes close to the cost of an Uber/Lyft for a single rider to many spots in the loop (and Uber would be cheaper if you have two people), and as you noted, people still have to deal with getting to your final destination after you get off an express train at Loop terminal. Considering many have luggage, that means another $5 cab ride at a minimum for most. Outside of those that live in the loop and (Hyde Park if they actually build a terminal there), regular Chicagoans just aren’t going to use this much IMHO. This is another example of Rahm essentially doing something for tourists and convention-goers to boost Chicago’s profile, rather than improving City services for people who actually live here. The Atlantic did an interesting article on what factors have contributed to the divergence of cities. One of the conditions for a good economic future is the quality and service of the city’s airports. O’Hare – Magnificent Mile – McCormick Place service pattern. I estimate maybe around 16-17 miles from O’Hare to Michigan Ave along the track, so an electric train can probably get to the Near North in under 15 minutes and to McCormick Place in 25 minutes. In addition, this infrastructure would allow improved local service in the NW part of the city and maybe some through-running at Millenium Station between MD-W and ME. In this Streetsblog article, you can clearly see how Rahm’s administration panders to the top “1%” of his rich and influential Campaign Contributors. IT IS TIME FOR Rahm TO GO!! Toronto fell right into the sunk costs fallacy. When their private partner SNC-Lavalin backed out and they couldn’t find a replacement, they should have abandoned the project. Instead, they had already invested tens of millions in studies and engineering, so they felt they had to spend hundreds of millions on construction. With that being said, this project needs to be evaluated on its own merits, not the merits of Toronto’s system. Like any business scheme, this is a balancing of costs vs. potential revenues, and the scales might tip more favorably in Chicago. Chicago already has a robust, publicly-owned 3-track Metra line that gets 90% of the way from downtown to O’Hare. Toronto had a similar rail line, but it was a puny 1-track line that had to be upgraded at a high cost. It’s possible that a Chicago project could be accomplished cheaply, with Metra’s cooperation. -Link up with Metra NCS ROW to O’Hare. Express stops after the Loop at Ashland, Kedzie, Cicero, Austin, Forest Park, 1st Ave and North, Belmont, and Rosemont. I travel to ORD every week for work travel and would love to get there faster. glad to see that the city is going to investigate new/improved options. curious about the use of the phrase “luxury train service” in the context of this project. seems more like “express train service” to me. maybe i’ve missed the details of additional services that would be offered to the customers. IINM, a big problem with the Carroll Street ROW is that it’s low, barely above river height. The bridge to access it across the north branch to Wolf Point was usually kept up as it impeded river traffic, much lower than the other bridges. The Sun Times was the last customer to use it until they moved their plant (where Trump Tower now stands). It’s been proposed from time to time (most recently to run buses from Union/OTC to Michigan). So if the 1% paid say $25 to $35 bucks to get to ORD, with 800,000 riders could net 20 to 30 Million dollars a year. Evans told the Sun-Times the fare would be in the $25-to-$35 range, more than ten times the cost of a normal ‘L’ trip (OK, it costs $5 to board the Blue Line from O’Hare). While the express trains may not be particularly luxurious, they’ll be charging a luxury price. I’m trying to figure out who they think the ridership for that is, that like the price point and go to the airport (and don’t need a last-leg transport connection from Union) often enough. Seems like a really small market segment to me. And if it doesn’t run at least every 20 minutes all day on weekdays it wouldn’t be useful even to them. Looking at the big picture – it seems that Chicago is getting in line with some of the high level studies from other agencies. CMAP, MWHSR, Amtrak, have all endorsed some form of Cross Rail solution if not by name. But it will need cooperation with Metra. Look for Metra to warm up to the idea next and be the beneficiary of phase 1. And the whole thing will be built incrementally with the A-2 rail/rail separation as a primary project. And a higher concept station at Ohare also part of the phase 1. Phase 2 could be road/rail grade separations. Phase 3 will be electrification and the terminal tunnel. Phase 4 could be the SCAL link to McMK and Hyde Park. this is a good point. if the plan is supposed to appeal to business travelers, my gut tells me (as a business travel myself) that unless the hard product (the train cars, seats, ride comfort, etc) is drastically improved business travelers will still opt for driving options. unless the ORD-Loop travel time got down to 10-15 minutes, i think it’s going to be hard to build share from this picky consumer segment. I think that when the idea first emerged in the Daley era, the target ridership was composed almost entirely of the International Olympic Committee, and nobody in city hall ever really shifted from that line of thought. They’re thinking more in terms of marketing the city and how having such a service would position us in the ranks of “world-class cities.” My guess is the likelihood of success is irrelevant to them. It’s just something to have. This whole thing will be an epic flop and taxpayers will be stuck again paying for another boondoggle. CTA can’t figure out how to run express to O’Hare??? Thanks for pointing this out. This is exactly what will happen in Chicago. Follow the money here and see who’s getting the engineering contracts. If Cross Rail is built, I don’t see the value proposition of the Airport Express, except maybe checking bags downtown. But that isn’t worth 20 to 30 dollars, is it? So, for private capital to come in, they will want exclusivity that would likely prevent Cross Rail. Clearly, Rahm and his predecessor do not have good options because transportation’s “governance” is so diffuse, particularly when Illinois has been doing such a poor job. Indeed, Illinois has the authority and does not care. The Airport Express and Crossrail require regional and even national authority (and loans) to be made correctly. This is not a Mayor’s job; but it is his job because no one else is doing it and transit upgrades must absolutely be made quickly. Citizens need to stop carping about their elected officials and attack the problem: transportation “governance” that has been able only to build roads. We need a special taxing authority that invests intelligently in transportation solutions… instead of giving money to keep alive the old nags who can’t seem to get out of the barn anymore. discovered a blank version here https://goo.gl/bX2uLG.